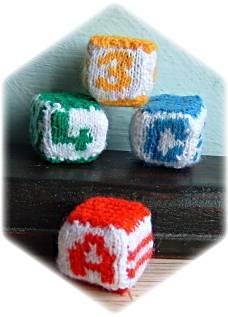 ﻿Following the success of last year’s Advent Calendar we have decided to again feature a special Advent calendar for miniature knitters. We had a good response to our request for suggestions in our October Newsletter. Ideas were many and varied and we decided to make this years project interesting but not too complicated so that it will appeal to all levels of knitting ability. This makes the project suitable for both novice and more experienced knitters. The patterns are also designed to use oddments of yarn you may have in your workbasket and a commonly used needle size, which many people will already own, thus keeping your costs to a minimum. This year’s calendar will make a set of four 1/12th scale brick toys with alphabet, numbers, textures and geometric shape designs. Each brick is made up of 6 small squares which when stitched together will make a cube. on each of the 24 days of Advent, with the final square and finishing instructions being given on 24th December. The Advent Calendar will remain online until mid-January 2011 to allow people unable to join in during Advent a chance to complete the project. After this time the calendar will be removed and will be available for purchase. I liked the post and the information which you had posted is quite interesting. I would like to know some more information regarding same topic. I would like to follow your post in future, keep posting. Thanks for sharing. Advent Calendar Day 20 the door is open! Day 17 The door is unlocked! Day 10 of our Advent Calendar is here! Advent Calendar Day 9 - The door is open!